Juniper shrubs and trees are a great asset to landscaping. They can grow tall and eye catching, or they can stay low and shaped into hedges and walls. They can even be formed into topiaries. But sometimes, like the best things in life, they get away from us. What was once a smart shrub is now a wild, overgrown monster. So what can you do with a juniper that’s gotten out of hand? Keep reading to learn more about how to prune an overgrown juniper. 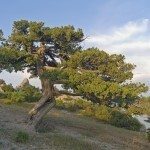 Can you prune an overgrown juniper? Unfortunately, the answer to this question isn’t a definite yes. Juniper trees and bushes have something called a dead zone. This is a space toward the center of the plant that doesn’t produce new leafy growth. As the plant gets bigger and thicker, sunlight is unable to reach its interior, and the leaves in that space fall off. This is completely natural, and actually the sign of a healthy plant. Sadly, it’s bad news for pruning. If you cut back a branch below the leaves and into this dead zone, no new leaves will grow from it. 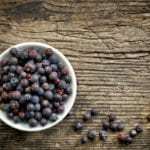 This means that your juniper can never be pruned smaller than the border of its dead zone. If you keep up with pruning and shaping as the tree or shrub grows, you can keep it compact and healthy. But if you try to attempt overgrown juniper pruning, you may discover that you just can’t get the plant down to a size that’s acceptable. If this is the case, the only thing to do is remove the plant and start again with a new one. 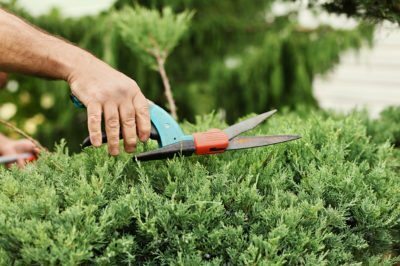 While overgrown juniper pruning has its limits, it is possible to trim your plant down to a more manageable shape. One good place to start is the removal of any dead or leafless branches – these can be cut off at the trunk. You can also remove any branches that are overlapping or sticking out too far. This will give the remaining healthy branches more room to fill out. Just remember – if you cut a branch past its leaves, you should cut it off at its base. Otherwise, you’ll be left with a bare patch.